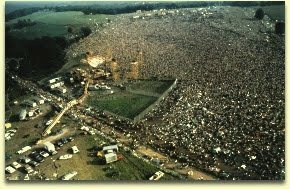 Forty years ago, over 300,000 people were turned up to watch Jimi Hendrix and many others at The Woodstock Festival in August 1969. People from all over America congregated on a 600acre dairy farm in Bethel, New York to spend the three days with music and peace on their minds. The music began Friday afternoon, August 15, at 5:07pm and continued until mid-morning, Monday, August 18. It was one of the Greatest and most pivotal moments in the history of rock and roll. Woodstock turned a rain soaked chaotic gathering into the greatest rock festival ever. It involved performances by legendary artists like The Who, Santana, Janis Joplin, Creedence Clearwater Revival, Joe Cocker, Jimi Hendrix, Grateful Dead, Jefferson Airplane, Crosby, Stills, Nash and Young and Pandit Ravi Shankar and many more, over the course of four days. 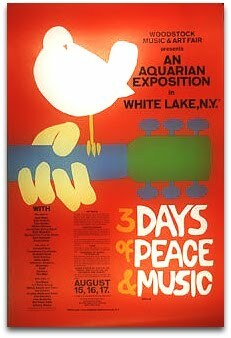 Woodstock was initiated through the efforts of Michael Lang, John Roberts, Joel Rosenman, and Artie Kornfeld. It was Roberts and Rosenman who had the finances. The idea started off as retreat-like recording studio but evolved into an outdoor music and arts festival. Woodstock was designed as a profit-making venture. It famously became a "free concert" only after it became obvious that the event was drawing hundreds of thousands more people than the organizers had prepared for. Tickets for the event cost US$18 in advance and $24 at the gate for all three days. Creedence Clearwater Revival were the first act to sign a contract for the event, agreeing to play for ten thousand dollars. The Beatles, The Doors, Led Zeppelin, Jethro Tull, Bob Dylan are amongst the few who Declined invitations for the Woodstock festival. Woodstock, although didn’t seem all that important at the time, turned out to be the Apex of their careers for many who did perform. Serendipity can appear in unlikely places and come from unexpected sources. By Wednesday, August 13, the lush green bowl in front of the massive 75-foot stage was already filled with some 60,000 people. On Friday the roads were so clogged with cars that the only way, most artists could reach the festival, was by helicopter from a nearby airstrip. To add to the problems and difficulty in dealing with the large crowds, recent rains had caused muddy roads and fields. The facilities were not equipped to provide sanitation or first aid for the number of people attending; hundreds of thousands found themselves in a struggle against bad weather, food shortages, and poor sanitation. But nothing could stop the revelation. On the whole, the festival was peaceful; considering the size of the gathering. There was a sense of social harmony, the quality of music, and the overwhelming mass of people, many sporting bohemian dress, behavior, and attitudes. True believers still call Woodstock the capstone of an era devoted to human advancement. Cynics say it was a fitting, ridiculous end to an era of naiveté. Then, there are those who say it was just a hell of a party. Even Though Woodstock faded away into a legend, it has forever become a part of the cultural lexicon. It will be etched in the minds of those who were there to witness this celebration of freedom and peace engulfed by music. For others it’s a chronicle of music transcending all boundaries to bring people together. Woodstock has become an idea that has suffused human culture, politically and socially, as much as musically. Two days after Woodstock ended, the 'New York Times' ran an editorial praising what had happened at Bethel. It concluded with a quote from Shakespeare's Henry V, which seems appropriate upon the fortieth anniversary of Woodstock: "He that outlives this day, and comes safe home, will stand a-tiptoe when this day is nam'd".